Nothing much has changed over the last 24 hours other than the conditions have calmed down a little and the non easterly facing beaches are nice and calm. 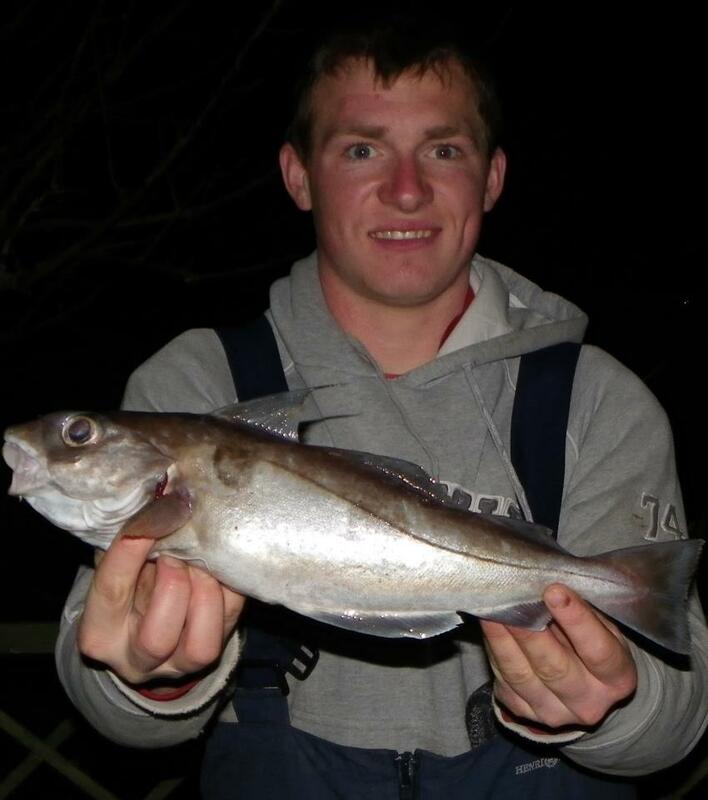 I thought I would share this picture of James Lane’s Haddock that he caught on Saturday at Abbotsbury. Thanks to Dave Lane for permission to use the picture. I will put it forward for March fish of the month. Chesil Beach: Calm with a small swell . The water is still very dirty towards Abbotsbury, but it is clearing at the Portland end. Portland Harbour: Wavelets with clear water. Weymouth Bay: A bit of surf on Preston Beach with quite a lot of colour in the water. Chesil Beach forecast: Fishing is certainly better towards the Portland end of the beach. No great numbers of fish have been landed but the number of different species makes it more interesting. A few and I do meen a few Mackerel are starting to show on the beach. Small tides meen that you will want to use a plain lead when fishing for Plaice at West Bexington, Cogden and Abbotsbury. Portland: Pollock have made an appearance in numbers off Portland Bill the past few evenings. Lure fishing has taken most of them. I would expect to see some Wrasse caught in the same area today. It is better to target them with bait with the cold water that we have. Portland Harbour: If the sun stays out then hopefully the shallow waters in the harbour will warm up and encourage bait fish in. That combined with the start of the Peeler Crab moult and we should soon see Bass moving in to feast on them. Peeler Crab and Lures will work equally well when they do turn up. Keep an eye open for bird activity, indicating that bait fish are about. Weymouth Bay: Preston Beach with the surf running has to be a good option to target an early Bass. The Stone Pier is a good mark, especially for those on holiday with kids. Fishing is fairly easy from there and numerous species including Wrasse, Pout, Pollock and Sea Scorpions can be caught. All you need to do is drop a Ragworm down the side of the harbour wall. Small strips of Mackerel work almost as well. Boat Fishing: The Weymouth charter fleet have struggled to get out with the strong NE winds that we have been having. When they have got out fishing has been tough. However Chris Caines managed to find some very nice Turbot and Blonde Rays for his customers.